Hibs striker James Keatings has warned his team-mates that new boss Neil Lennon will bring a “fear factor” to the Easter Road dressing-room because he won’t accept his side drawing matches, far less losing. Keatings worked under Lennon as a youngster at Celtic Park and, although he believes the arrival of the former Northern Ireland internationalist is a “massive statement of intent” from the Capital club, he’s expecting a different style of management to that of Alan Stubbs. “Alan did a great job for us and he has moved on to a massive challenge down south. It’s a great opportunity for him and the boys wish him all the best and hope he does well. But with HIbs, Neil is a great manater to get. It is a massive statement of intent. The boys are all excited to work under him and see what he brings to the team. It is going to be good. As well as helping persuade players who might be in demand from elsewhere – Jason Cummings only this week being linked with a move to Turkish club Trabzonspor – stay at Easter Road, Keatings believes Lennon will help attract “some big players” given his status within the game. Lennon has already shown he’s not one to mince his words, branding the Hibs sides he faced as a player as “a boy band.” But, while Keatings believes Lennon wasn’t necessarily speaking about the current team, he admitted things will be markedly different under his old boss. He said: “Alan and Neil are both man-managers and they are winners. Alan was a bit more chilled. Neil obviously has the fear factor. When he walks in you can feel it. He has that about him where you are brought back a wee bit by it. I was a young boy at Celtic when he was there and when he walked into the changing room he could silence it, so he has got that about him. “I don’t know what to say about the boy band comment. He was talking about when he played against Hibs although there are a few of our boys who could fit into a boy band now like Jason and Danny [Handling]. He has seen Hibs and he is going to come in and want to change that mentality. Keatings believes the scenes which followed Hibs’ historic Scottish Cup triumph, 150,000 people turning out on the streets of Edinburgh to watch the trophy being paraded the following day, simply underlined the potential within Easter Road and feels both that euphoria, allied to the disappointment of losing the League Cup final and missing out on promotion, will help drive him and his team-mates on in the coming season. 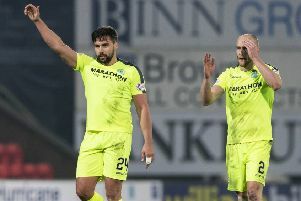 Although he suffered a season which was, to a large extent, spoiled by injury, Keatings managed to get his goals tally into double figures for the third season in succession and has his sights even higher, his fingers crossed that Cummings, Hibs’ leading scorer in the past two years, remains at the club. Hibs also have a Europa League campaign to look forward to, Keatings admitting that’s something he’d dreamt of as a boy but, he admited, it’s important the Capital club get their Championship season off to a flyer having lost two of their first three games in each of the past two years.